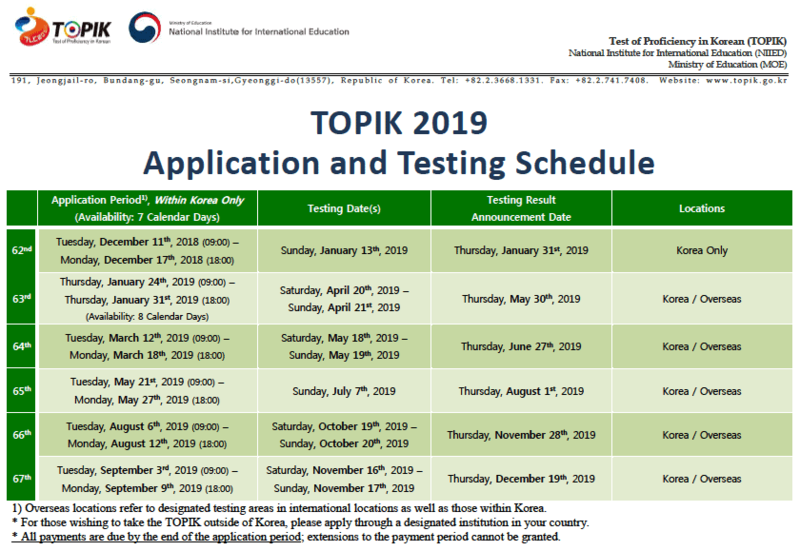 For all those who are planning to take the TOPIK test (Test of proficiency in Korean) in 2019, we are posting all the details of the TOPIK test in year 2019. 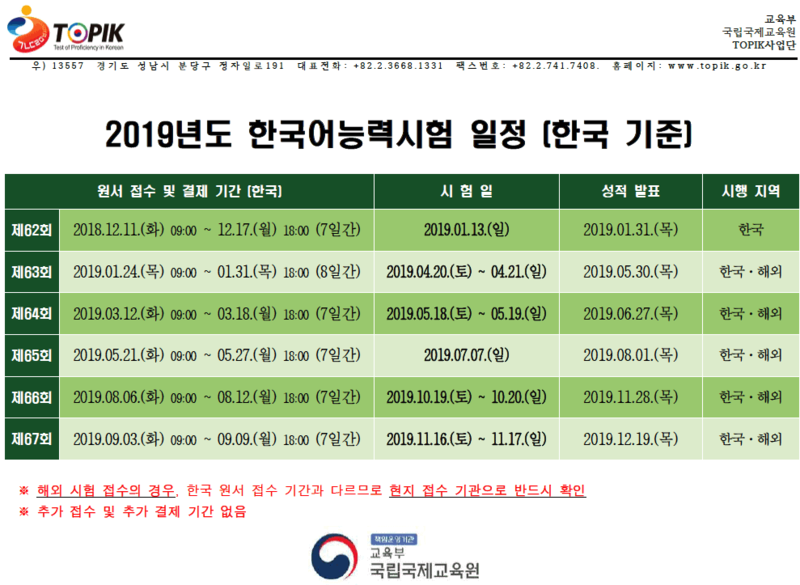 In 2019, TOPIK will be held 6 times – once in Korea only (in January) and 5 times in Korea and overseas (in April, May, July, October and November). 62nd TOPIK, 63rd TOPIK, 64th TOPIK, 65th TOPIK, 66th TOPIK and 67th TOPIK tests will be conducted in 2019. After you familiarise yourself with the test structure you may want to download past TOPIK papers to get a feel of the test. You can also practice online with TOPIK GUIDE Mock Tests. There are many more study resources for TOPIK test preparation on this page – Best TOPIK Tips and Resources. Whether you are taking the TOPIK Test for the first time, or you just want to pass a higher level, we would strongly recommend the Complete Guide to TOPIK – Self-Study Package. It is a digital study package that has everything you need to get a high score in the TOPIK test – all the past TOPIK papers with answer sheets, Korean grammar and vocabulary study material, video tutorials explaining the test structure, strategies to solve them and much more. You can check out more details about this study package here – TOPIK GUIDE – Self-Study Package. For further details about TOPIK test in your country please contact the local Korean embassy or Korean Culture Centre. **Registration dates may vary in different countries. Please check with your country’s affiliated institution or contact local Korean embassy. 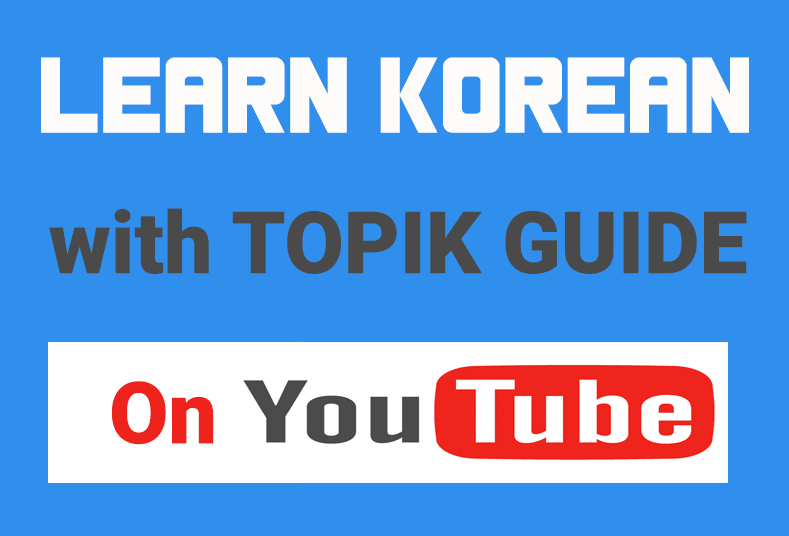 For further details you can contact Korean Embassy in your country or visit the official TOPIK website: www.topik.go.kr or contact NIIED office – 81, Ihwajang-gil, Jongno-gu , Seoul, 110 – 810, Republic of Korea. Tel : +82-2-3668-1331. Fax : +82-2-741-7408 . Keep checking TOPIK GUIDE website for further updates and more study resources.